Dominican Republic: "Lutherans Make it Simple and Clear!" 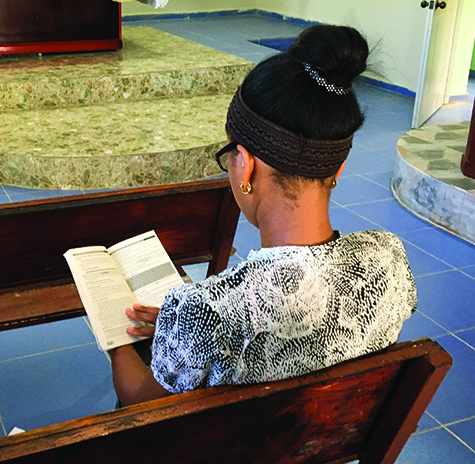 A young Domincan woman studies LHF’s Spanish-language Bible with Small Catechism in her church. Q: How does having good Lutheran books, written in your own language, help the church in the Dominican Republic to grow stronger in faith and/or greater in number (Gospel outreach)? A: Having solid Lutheran books translated into Spanish provides our people with a confirmation and expansion of the eternal truth we learn from our pastors in church. It serves pastors, people, deaconesses, and seminarians as a text for mutual reflection and further education. Q: Do you know of a particular person who has benefitted from reading the catechism? A: Throughout the Dominican Republic, and indeed, across all of our Latin American missions, the Bible with the catechism printed in the front is used in our churches and schools. It is an extremely useful resource, because it is immediately available and, as long as the person can read, folks are able to learn from it. In Palmar Arriba, Dominican Republic, a man I met named Antonito was greatly dissatisfied, as his priest didn’t teach him any Christian doctrine. His search for understanding took him from one church to another in search for clarity. When, after finally landing in the Lutheran Church, he began to read Luther’s catechism printed in the front of the Bible LHF published, he exclaimed to me: “The Lutherans make it simple and clear.” He has been here, and he isn’t likely going anywhere else. Antonito is one of a host of others who have said similar things. Q: As you know, 2017 is also the year we celebrate the 500th anniversary of the Reformation. How is what Luther taught in 1517 still important today, in the Dominican Republic? A: Luther exposed the abuses of the Catholic Church and began to teach against the mass and the selling of indulgences, which was basically charging money for grace. In the Dominican Republic, a predominantly Catholic culture, it seems that the issues faced by the Lutheran reformation are more relevant to this culture than perhaps most others. Steeped in medieval-like Catholic superstition, it is common practice for Dominican priests to charge their people for religious services. It is that way across Latin America, but here in the Dominican Republic, quite a number of people, lacking an opportunity for education, are unable to read the Bible. Much like in Luther’s day, the Gospel comes across as fresh good news in the face of the abuses of the Catholic Church. Q: LHF will soon be publishing a Spanish-language children’s Bible (A Child’s Garden of Bible Stories) and a Lutheran hymnal that will be used throughout Central and South America. Why will these publications be important in the life of your churches? A: You can’t really teach anything to kids until you first teach them the Bible stories. These publications will be useful tools for teaching children and others who have limited reading skills. Since this is a fairly illiterate culture, a high premium has been placed recently on increasing literacy in the Dominican Republic. With such a big push for literacy, and folks jumping at the opportunity to learn, we may easily enter in—indeed, we are invited by the public schools in our community—to teach biblical literacy at the same time. This is the basis upon which we then move in with the catechism and further instruction. The hymnal is important because it is important to involve the children, especially a new and fledgling church. Our experience here has been that the kids learn the gospel and then go home and teach their parents.